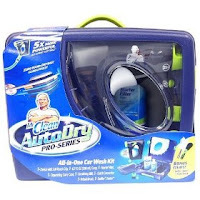 Amazon.com is selling the Mr. Clean AutoDry Pro Series Bonus Kit with Swiffer Duster and Tire Brush set for $11.35. This set comes with everything you need to quickly and efficiently clean your car. The kit comes in a convenient case that can easily store in your trunk. A few packs of soap to help you get through your first few washes, and other specialized attachments such as a tire and rim cleaner. This set sells for up to $30 from other retailers and is a bargain at this price.